L-FRESH The LION – The Truth in Australian Hip Hop! Conscious hip hop has always held a very special place in my heart. Artists that dare to speak the truth and shine as light on the world’s issues and matters of the heart resonate with me on a truly holistic ground, showcasing the truth as it stands and breaking the stereotype that hip hop is a superficial and materialistic genre. L-FRESH The LION is said artist and being that he not only rhymes on a socially aware, politically correct and respective realm, his subject matter ranges from domestic / emotional abuse awareness, racial awareness and cultural pride and acceptance. 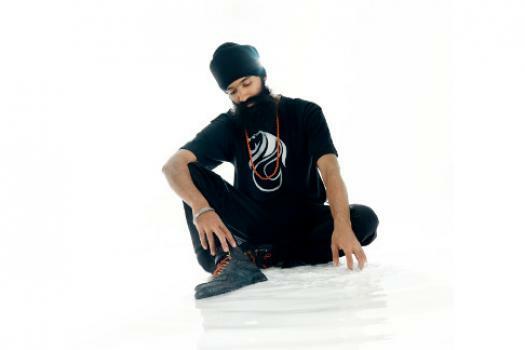 When you first meet L-FRESH the LION you are see a man walking proudly in representation of his traditional Punjab Indian heritage, as he rocks out on stage with the pride in his long beard and turban. Intrigue immediately follows as with L-FRESH The LION, what you get is what you see, nothing more or less. He proudly represents his youthful days growing up in Sydney before moving to and calling Melbourne home. His music is aware, thought provoking, honest and as real as it gets. He is a beloved artist on Triple J’s Unearthed show, shining a light on new independent artists that are paving a whole new way for the emcee with a conscience. His debut single “One” is getting major spins on the airwaves and amongst his growing fan base. You can catch L-FRESH and his amazing band ( which features the electric Mirrah ) bringing the house down no matter where they appear in Sydney and Melbourne, bringing forth a show that brings the crowd to its feet and crosses the cultural barriers with a crowd as diverse as L-FRESH and his sound. It is an absolute breath of fresh hair to see a unique and uber talented artist with character and purpose take his place in the Australian Hip Hop community. L-FRESH is an artist that is sans ego, focusing rather on creating music with a message and paying respect to those that paved the way to make his journey possible. Like the socially aware hip hop sages that serve as inspiration to his current wordplay, it is safe to say that L-FRSH The LION can hold court with the likes of Common, Talib Kweli, Chuck D and Mos Def when is comes to rapping for a reason. Big call some would say, but when you have the great KRS-1 stating that L-FRESH “ is Hip Hop” the ante is upped and the game changes to more than just that of an aspiring hip hop artist. I am beyond excited to have interviewed this stellar wordsmith and share his hip hop story on a personal level. He represents all that is real and true in our community and is determined to hold Australia in the highest Hip Hop light! Who is L-FRESH The LION and what does he mean to Australia’s Hip Hop industry? I’m L-FRESH The LION. 24 year old Hip Hop artist/MC. Born and raised in South West Sydney (currently residing in Melbourne) to a mother and father who immigrated to Australia from Punjab (India) and then paved the way for me to a bright future. I’ve been writing, recording, producing and performing for the past 10 years now. I value powerful sounds and powerful messages. I’m not sure what I mean to the Australian Hip Hop industry. That’s not a question for me. That’s for the people to decide. I can only control the energy that I bring to it. Every time I get on stage or in the recording booth, I put my all into it; my heart and soul. I want you to feel the fire in my chest when I rhyme and when I speak. I’m a MC. And as a MC, I have a duty to give you my truest self; and to show you the world that I see. So that’s what I do. I give you who I am. I’m Forever Rising Exceeding Sudden Hardships. That’s FRESH to me. To always overcome; to rise; to surpass struggles and hardships to become the best that I can be. I am the LION. That name was given to me at birth; a title bestowed on me by my ancestors who were saints and soldiers. What started you on your musical journey and why Hip Hop? My musical journey has always existed; since my birth. Every experience contributes to my journey. I picked up Hip Hop because it resonated with me. The raw emotion that was expressed through Hip Hop spoke to me. I come from an aural tradition. In Punjabi culture and in my faith, stories and lessons are passed down through music, poetry and spoken word. To me, Hip Hop music is an extension of that tradition. In it, I found a means of communicating my story. I also found a way to better listen to myself. And it has since contributed to my self development. When I become a better MC, a better artist, I also become a better person. Your shows are full of energy and your message a truly positive one – elements that aren’t always found in the mainstream Hip Hop music of today. What would you say are your muses or influences for creating your sound? I’m a student Afrika Bambaataa, DJ Kool Herc, Grandmaster Flash, KRS-One, Public Enemy and the legendary Roots Crew just to name a few. I’m all about building, getting better as an artist and as a MC, and I understand where Hip-hop and Hip Hop comes from. In knowing the true history of Hip-hop and Hip Hop, I can only give my full energy and to share positive messages. Hip Hop is about knowledge. It’s a movement of knowledge and self-empowerment. That was taught to me by the founders and the teachers of Hip Hop culture. So I carry that essence. Tell us about your band, the setup, members and the general vibe of the L-FRESH crew and philosophy? We’re a family. We are all from different walks of life. We come together in the name of good music. We understand that we are each unique individuals, yet we are brought together by the innate connections we share with each other. We stand for good music and good vibes. We thrive on creating unique moments in time that people can take home with them to store in their memories. There’s 7 of us in total: myself on vocals, Mirrah on vocals (Universal Zulu Nation), MK-1 as DJ (Universal Zulu Nation), Chris Zammit on bass, Clinton Manshanden on drums, Duane Critcher on guitar and Tee Togia on vocals. You have a few singles and music videos doing major circulation on YouTube, Facebook etc. …..what are your plans for releasing an official album, single etc in the future? I’m releasing an album in the near future. It’s titled “One”. At the moment, we’re coming off the release of the first single from the album, which is also titled “One”. The music video for it is up online and the song is on iTunes and it’s a free download on triplej Unearthed (http://www.triplejunearthed.com/L-FRESHTheLION). The plan is to get that out to as many people as possible. Then I’ll drop the second single. I can’t wait for people to hear it. Your background is very unique in that you represent a special Indian culture –can you please share with us your cultural background and how that plays a special role in your creativity? My cultural background is Punjabi. I hold the way of life taught by my faith close to my chest. I’m a Sikh, which in English, translates to student. It inspires all that I do, in the sense that it informs my way of being and the values that I hold. I am who I am because of where I come from. I acknowledge and nurture my roots. Although Hip Hop may seem quite distant from my cultural background, that’s not necessarily the case. Like I mentioned earlier, I come from a tradition that passes information, stories and lessons through the spoken word and music, whichis, in essence, Hip Hop. The people / artists that inspire you and why? My people and my ancestors. Hip Hop founders and teachers. And just good, positive music in general. I keep my ears and my mind open. You never know what you may discover. Your thoughts on Australian Hip Hop in the global scheme of things? The Australian scene is growing. It’s touching different parts of the globe. More importantly, it’s beginning to really diversify locally, which will, in turn, allow it to expand its reach globally. What is the L-FRESH blueprint for success? Forever Rising Exceeding Sudden Hardships. That’s the philosophy I live by. Dedicate yourself to yourself; to yourself improvement and empowerment. Dedicate yourself to knowledge. And dedicate yourself to peace. Your future projects, shows, releases etc. …. http://www.L-FRESH.com, http://www.facebook.com/LFRESHTheLION and http://www.twitter.com/LFRESHTheLION. At the moment, it’s all about the album for me; trying to raise awareness about it so that when it’s ready to go, people will receive it well.